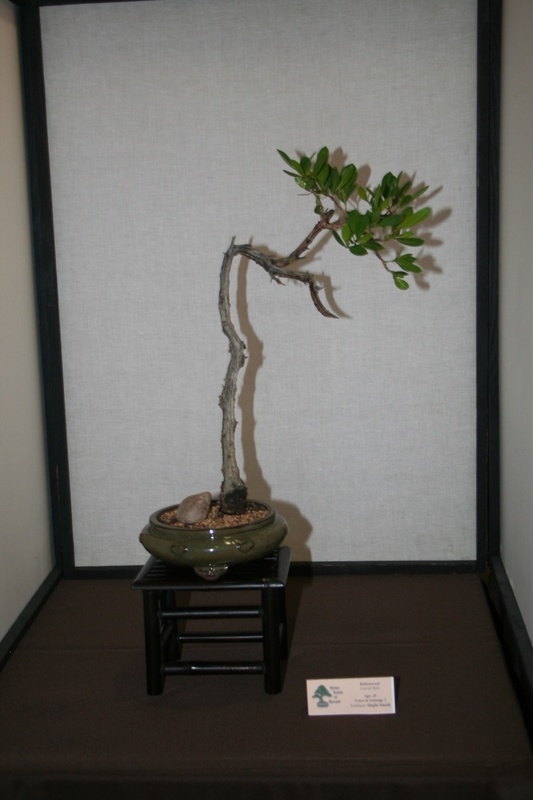 I tend to study loots of Bonsai books for inspiration in style and also display and was wondering if there was a hard and fast rule when it came to displaying trees in round/drum pots? Most of the display images I’ve seen feature trees in oval or rectangular pots but very few in circular ones. Most seem to use a wooden burr to display the tree rather than a table. If we use this image as a case in point, what would be the most ascetically pleasing route? Most of the trees I’ve seen in drum pots are quite “feminine” and to me the burr seems the perfect choice but am I right? I know that it is mostly down to personal taste so there is probably no definitive answer. image is to large to see at one glance. Made it smaller, hope you don't mind. Have to chew on this, back later. Jim if it offends please remove, I am taking a chance here. Thank you. I think it is a matter of taste and what you have available. My problem is that I don't have a large burr so I would have to use a table. Also I think it is more Bunjin or Literati that are placed on burrs. Now at our show this weekend one display used a cascade stand for a Literati. In this case the stand is mine but the tree is not and I didn't set up the display. The Nov/Dec 2010 issue of Bonsai focus has a detailed article on "correct table for your trees (Part Two)" authored by Kunio Kobayashi (translated by Peter Warren). It is worth the read! Hello Simon. I think your Honeysuckle would look better on a Burr personally. Regarding the use of the word burr - is this a case of a common language separated by an ocean? In the USA we call a slab made of burl wood a burl slab. A burr can be many things including a thorny seed pod and a metal shaving formed by a cutting tool. As for the tree, I think a shallow simple stand with legs would work best. Slabs (burl wood or otherwise) usually work best for tall literati type trees. I agree about literari trees but then again round pots don't seem to look right. I wasn't exactly looking for what was right for my tree, although it is helpful for the future, but non-literati trees on drum pots in general. My English is not that good that I understand the word burr. But I think I catch the question (correct me if I am wrong). The tradition / Japanese culture (from which bonsai comes) is to place accent plantings on flat wooden boards not raised from the table with legs. 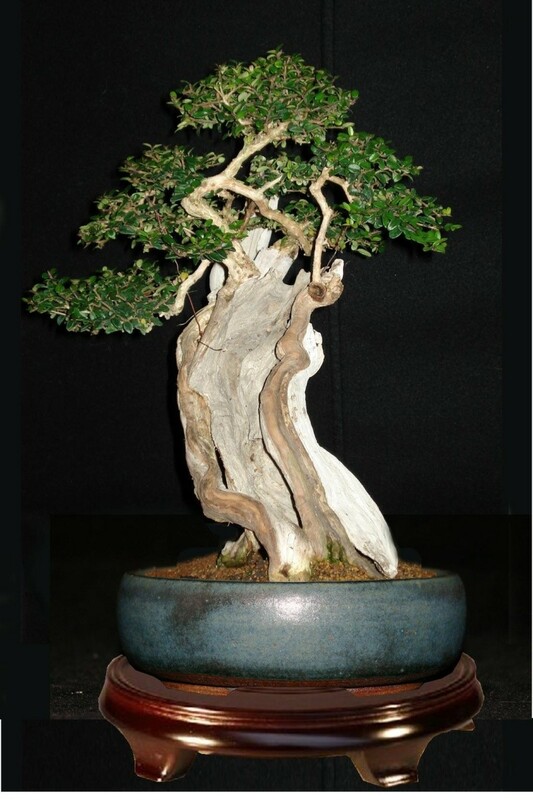 Bonsai are always placed on a table raised from the ground/table with legs. No matter what type of pot or style the tree is styled. It is the role of the display that is important, not the style of the tree nor the pot. 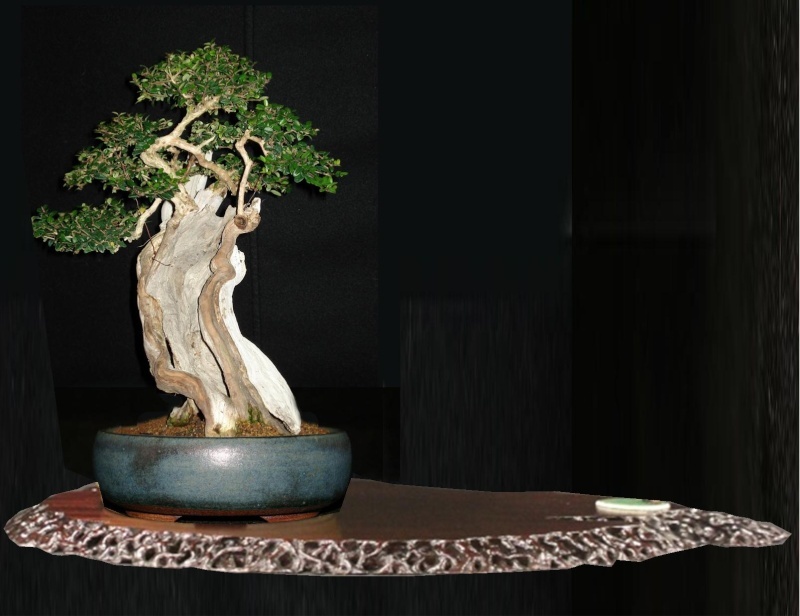 The bonsai is the most important piece of a display and raising it from the ground makes it more important and impressive. Accent plantings placed low a flat boards are supporting the higher raised levelled tree (bonsai) and underlining its beauty, growing place and year of time. But always as a support, shown by the low level placement. So (according to tradition) it is wrong to place a bonsai on a table/board/(burr) without legs. 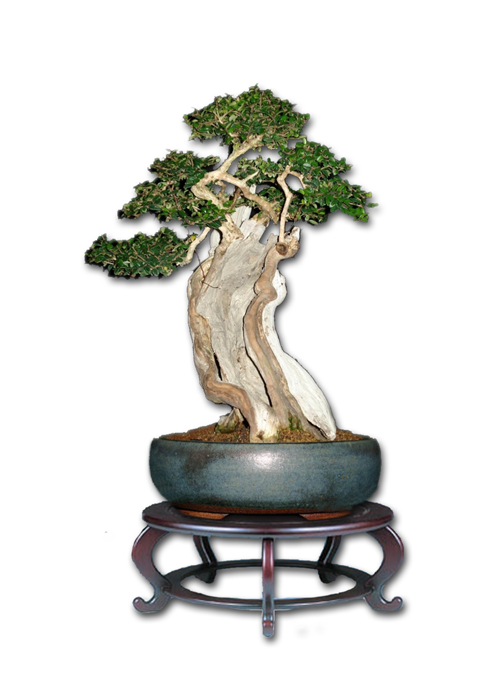 It always is presented by placing a bonsai on a table with legs raising it above ground level. (Allthough I have done the opposite my self in lack of a better solution). That's right Rob. burr = burl, colour = color, autumn = fall, etc. I've been reading Mother Tongue by Bill Bryson. Absolutely excellent! Rob, since we colonials seem to be outnumbered here these days by speakers/writers of English English, you need to get the "British/American Language Dictionary" by Norman Moss (Passport Books, 1984). It's the only way I can cope. Sorry that my description was not too clear for our international members. Morten, what you describe is the crux of what I was after and your reply was of great help although the shape of the table still questionable. What sort of shape would you recommend circular or square and short legs? A very interesting thread indeed that you have started. I am sure this will garner a lot of eyeballs and words in the days to come as there is a lot of tradition involved here. My humble take on the rather elaborate topic is that there are guidelines (rules?) for pots and also for display. Sure the guidelines say things like oval pots for feminine trees and rectangular pots for masculine trees, circular ones for Bunjin and so on and that sure makes sense. However as I have stated in other threads and also as I firmly believe, these (guidelines) are a means to the end of a visually pleasing tree display. I am also open to the possibility of not going by the guidelines and still meeting the end result of a pleasing display. For many the stress on the means(guidelines/rules) is so great that the end is of no consequence. Just the fact that a tradition was not followed, overshadows everything including the end result however pleasing it may be. This is not ok with me personally. Your tree to me looks good in the circular pot that you have used. I also agree with Morten on the display bit about a stand with legs for a Bonsai and one without legs for an accent planting. The reasoning is perfect and was my learning of the day. 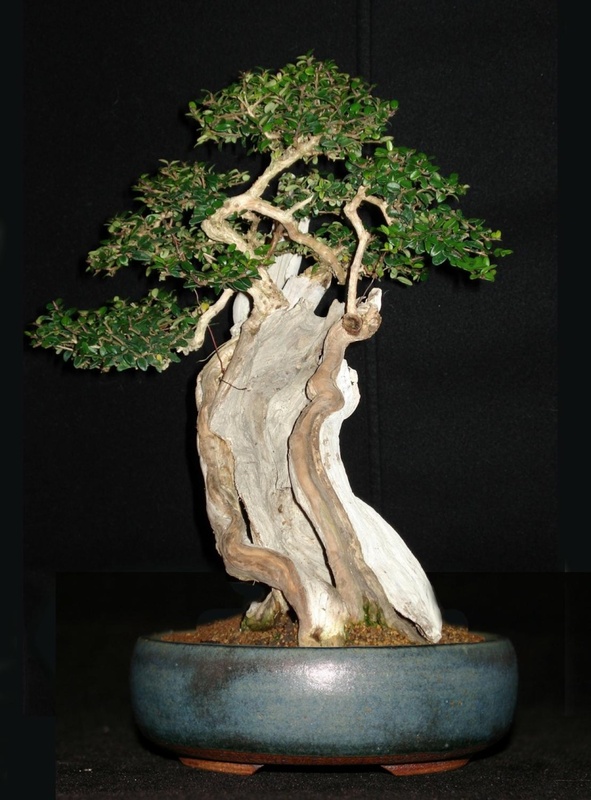 Having said that I think is it ok to display a Bonsai on a Burr when it is displayed without an accent planting. Taste is (like Billy says) a factor when choosing how the feeling of the display should be. The table must harmonise well with your tree and pot, so it all blends together well. That is nearly always difficult to match, and practising is very good and fun thing to do. Changing tables and scrolls, experimenting with the mood and feeling of the overall display is a very good training experience. Even small changes can have great effects. Regarding your tree I will suggest a table raised from the ground. But only slightly because the the tree has a compact expression, so the table must be able to look steady too. The soft curves of the tree I think must be reflected in the table. 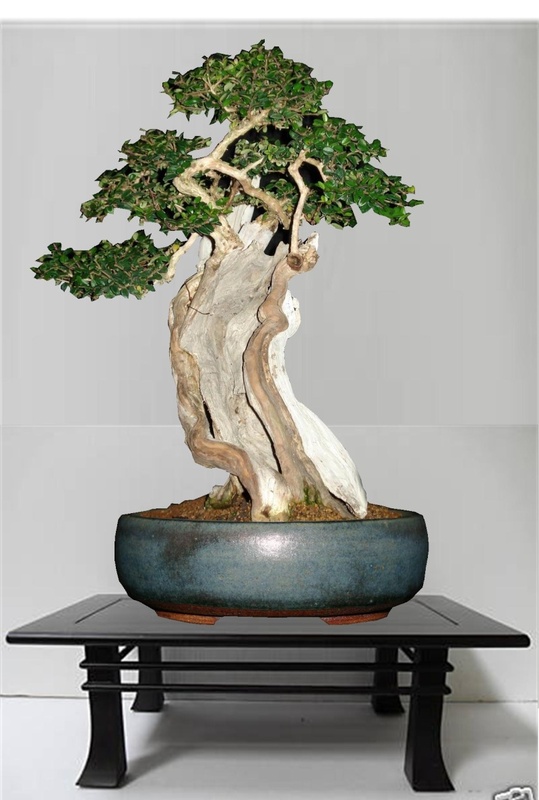 So I chose a soft curved table that underlines this image, and still looks strong enough to match the expression of the bonsai. This is just one suggestion. There will be a number of solutions, and it is a personal choice how the feeling of the display in general will be. Thanks for your feedback & virtual Morten, I'd best start looking for a table. will baddeley wrote: Hello Simon. I think your Honeysuckle would look better on a Burr personally. This sort of thing Will?